· ✈ (Return of a Mini Drone Button) Just press the return button, the drone will fly towards you. With the built-in positioning system, the drone can automatically locate. · ✈ (360° Vulet and Mini Drone Wheel) The simple flight of WSAD is boring, and the new Vulet and 3D Wheel special effects surprise everyone. 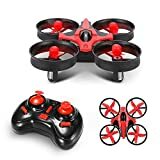 · (2.4GHz REMOTE CONTROL): Adopts 2.4 GHz remote control technology, It can be easily controlled to climb, down, fly forward or backward, turn left or right and fly sideways. · ✈ AFTER SALES SERVICE: Feel free to contact us by email directly when a problem occurs. No matter how serious the problem is, we will do our best to help you fix the problem, and don´t worry. All emails will be answered within 24 hours, we will resolve your problem as soon as possible.